Got my track wheels powder coated, Hankook R-S3s mounted and roadforce balanced. I also re-painted the center caps. Ordered 15 mm spacers front and rear and installed 45 mm wheels studs to replace the lug bolts. Looks good, did you do the caps with a tiny brush? 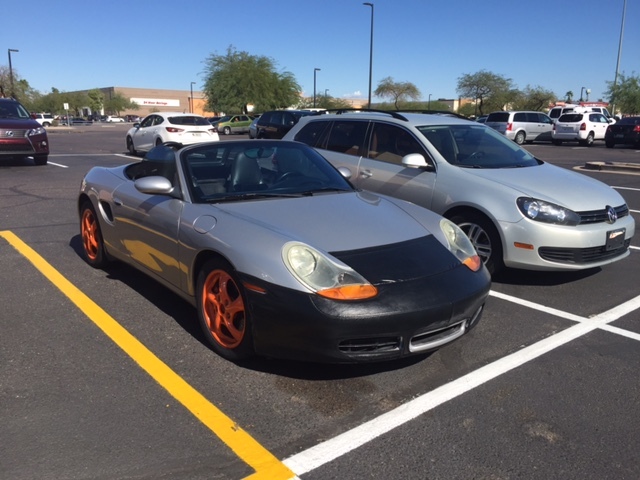 I finally went to Autozone and found some touch up orange paint with a brush. Finished with a couple clear coats. I like those. Any pics on the car from the side? 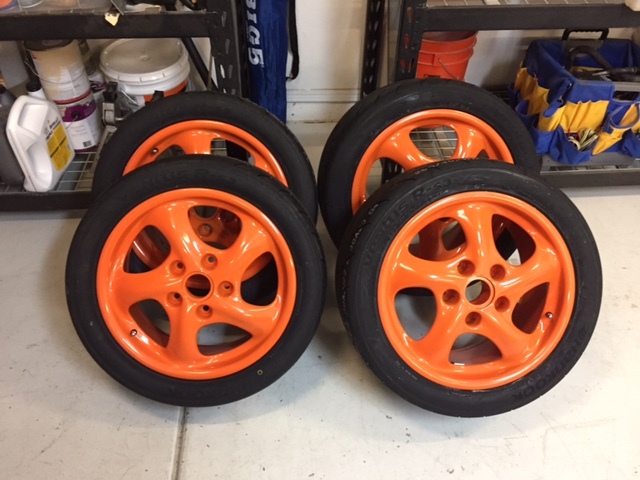 Been thinking about dipping my 17" twist a bright orange. Will be running 18's most of the time, but thought this would be a good alternative. This is my track setup. 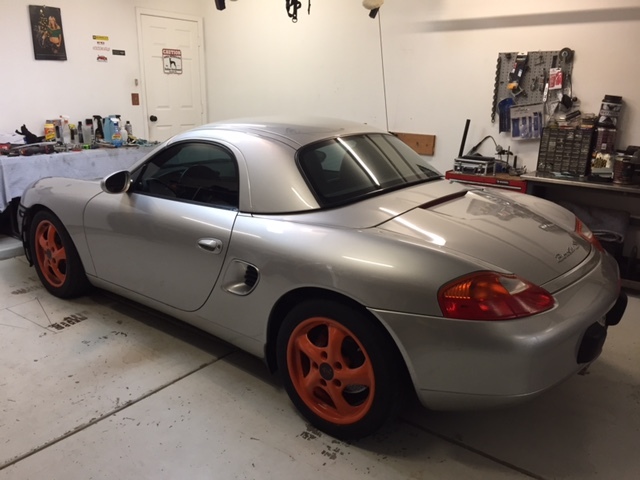 Hankook RS-3 tires (225F/255R) mounted on 17 in twist Boxster wheels that I had powder coated race orange, and I hand painted the wheel center caps. 15 mm F&R ECS Tuning spacers. I installed 45 mm Rennline wheel studs too. Other mods are listed in my signature, but stock suspension with Eibach sport F&R swaybars with a race tuned alignment with maxed out even camber of -1.0 F and -1.8 R, with 0.15 in Front and Rear Toe in. Know thinking of adding oil temp and pressure gauges. I already ordered slotted F&R Sebro rotors and EBC yellow pads for the track. And here's the hardtop I just acquired and installed. It still squeaks a lot so I need to adjust and/or put PTFE on seals. 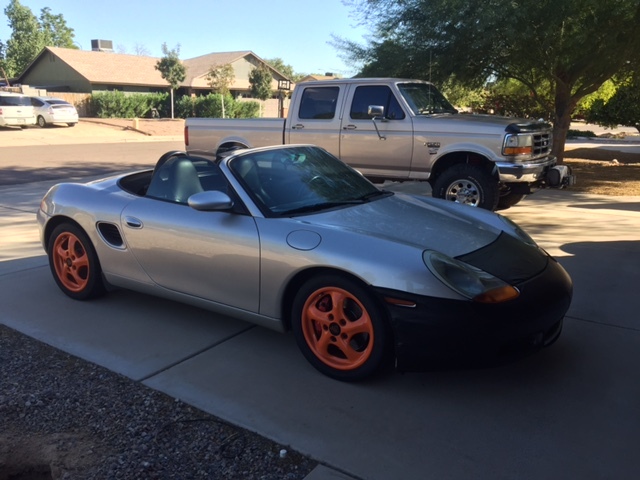 No video yet with the new wheels, but I have a previous one at Arizona Motorsports Park this fall (HPDE 1). This was my first solo run, so still need plenty of seat time, but I'm hooked! Last outing on Dec 10 was in HPDE 2 PCA group (@AMP) was awesome and the car handled extremely well, other than loosing brakes on the last couple laps of the 4th session. No video of that one. My goal had been 2:02 lap, and I ended up with best lap at 2:00. Last edited by AZ986S; 12-23-2016 at 10:16 AM. 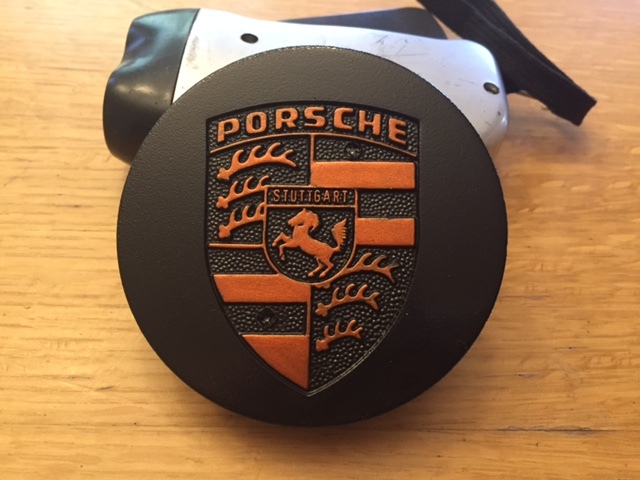 In addition to adjusting the top try some Gummpflege on the seals. Helped on my hardtop especially in Summer when the top expanded do to the heat. It's good stuff to apply to all seal to keep them from drying out. I got to get myself out to the next HPDE. The last few I was traveling for work and missed out. The next one is Feb 11 at Wild Horse Pass on the East track. Don't forget as of the first of January you need a 2010 or newer Snell rating. I'm thinking of joining Pro-Autosports for January and other events too. Yeah thanks, I just bought a 2015 Snell helmet... and thanks for the tip. I'll try the Gummflege. Easy one man job with my ceiling mounted hoist. I enjoy most AMP, but WHP East Track is fun too. I just like the fact that AMP has so much runoff room should I need it, and facilities are a little better. See you at WHP in February. Post up some track video in the racing section after your next DE, we'd all love to see the tracks you visit.